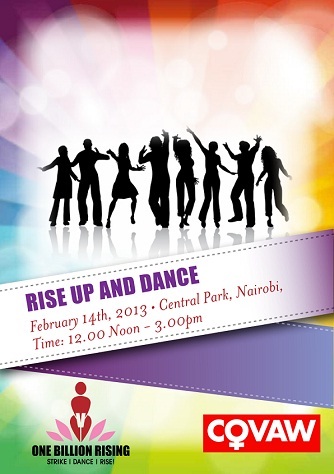 The One Billion Rising Strike, Dance and Rise event will take place on Thursday, 14th February at the Central Park, Nairobi. Time: 12.00 Noon and 3:00 p.m. Shocking statistics: One in every six women between 15 and 70 years has experienced physical or sexual violence in their lives. It is a fact that 3 out of 10 women in Kenya admit to have been physically and sexually abused by their spouses and Sexual partners. Daily Kenya. Simple theme. Powered by Blogger.